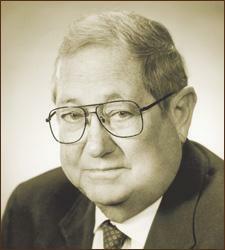 Bernie Greenheck was co-founder, president and chairman of Greenheck Fan Corporation in Schofield, Wisconsin for 55 years. Although he passed away in 2003, the impact of his leadership continues to help the company grow. In 1947, Bernie and his brother, Bob, began transforming a tiny sheet metal business in Schofield into what has become Greenheck, the world’s leading manufacturer of air movement and control products for non-residential buildings. Bernie Greenheck was instrumental in setting up and nurturing Greenheck’s network of independent sales representatives and used his extraordinary interpersonal skills to build vital relationships with both customers and employees. Today, Greenheck has 200 manufacturing representatives around the world, 2,400 employees worldwide and annual sales approaching $500 million. The company operates manufacturing plants in six U.S. cities and two plants in Mexico and China. Bernie Greenheck was born in North Dakota in 1917, spent much of his childhood in Lone Rock, Wisconsin, and then moved to the Wausau area in the early 1940s where he married his wife, Esther. In 1983, Bernie Greenheck was recognized as Central Wisconsin’s Outstanding Small Business Person of the Year by the University of Wisconsin-Stevens Point Small Business Development Center. To ensure that Greenheck customers and employees learned as much as possible about the ever expanding selection of Greenheck products, he created a national product center where all of Greenheck’s air movement and control products would be on display. Since it opened in 1996, the Greenheck Product Center has attracted more than 25,000 engineers and contractors from all over the world to Schofield. Bernie Greenheck frequently encouraged employees to give back to their communities as volunteers or financial supporters. Today, it is virtually impossible to find a local non-profit organization without a Greenheck employee involved. Bernie Greenheck and wife, Esther were tremendous supporters of the arts, and were major contributors to the renovation and expansion of the Grand Theater and Arts Block. Bernie Greenheck and brother Bob were the biggest contributors to the construction of the Greenheck Field House in 1997. Today, the Greenheck Field House serves the D.C. Everest Area School District and the entire Central Wisconsin community by providing indoor space for school activities, hockey competition, business expositions and other special events. In 1998, Bernie and Esther Greenheck established the B.A. & Esther Greenheck Foundation to help improve the quality of life in central Wisconsin where many of the employees he valued so much continue to live. Junior Achievement of Wisconsin’s Northcentral District is proud to honor Bernie Greenheck as a 2009 Champion of Business.